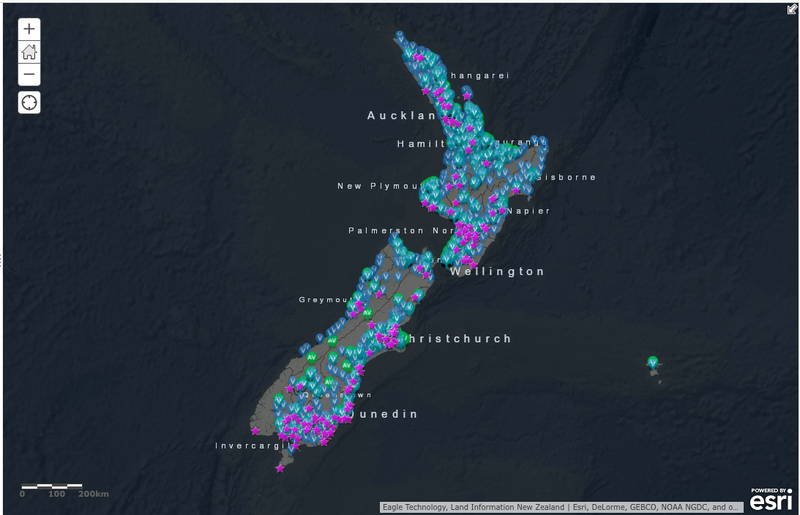 Archives NZ’s open dataset on the 1893 Suffragettes Petition, women in politics, the pending general election, and the National Library’s exhibition He Tohu, “He whakapapa kōrero, he whenua kura [Talking about our past to create a better future]” inspired us to do a little data mashup. We’ve mapped two open datasets that show the past and the present coming together on election day. some of the names of those who signed the Suffragettes Petition in 1893, leading to New Zealand becoming the first country in the world to award women the right to vote. For more information about the datasets we used, click on “more details” on the left hand side of the map. See and interact with the map at https://arcg.is/0vviff. Advanced voting places for the 2017 General Elections*, sourced from www.elections.org.nz/news-media/resources-2017-general-election/voting-place-and-advance-voting-place-coordinates. Voting places for the 2017 General Elections*, sourced from www.elections.org.nz/news-media/resources-2017-general-election/voting-place-and-advance-voting-place-coordinates. A sample of names** from the main suffrage petition submitted to Parliament in 1893 . The full dataset is available at nzhistory.govt.nz/politics/womens-suffrage/petition. Let us know if you’d like someone added to the map! * The general elections voting places published information is subject to change, is not the authoritative version. Authoritative information can be found at http://apps.apac.tomtom.com/vote2017/. * The sample was generated by taking a single name from each unique location in the dataset. It shows the spread of geographic locations (towns/cities), but it gives no indication of how many people signed the petition in each location. Justine is the powerhouse behind GovHack NZ’s social media presence on Twitter and Facebook (GovHack NZ and GovHack Wellington). Hit her up if she can help you with yours! aimee is one of the national leads for GovHack NZ, along with Nick Williamson, her co-founder for GovWorks NZ (for which this blog is home).